In some Grimpoteuthis spp. the shoulder is not always clearly defined as the shoulder blades which help define the shoulder are often absent. 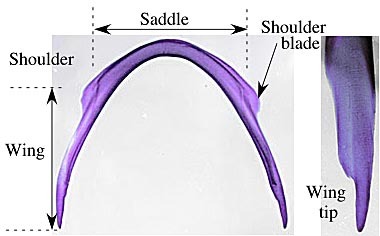 The wing tip can be a single spike, a flattened lobe or a more complex shape as shown here. Figure. Left - Dorsal view of a stained (methylene blue) internal shell of Opisthoteuthis sp. Right - lateral view of a portion of one wing. Photograph by R. Young. On some shells a ledge, called the basal shelf, extends anteriorly or posteriorly from the inner (= anterior) side of the saddle. Figure. Ventral and posterior views of the internal shell of Luteuthis shuishi with a very large basal shelf on the saddle. Photograph modified from O'Shea and Lu, 2002. O'Shea, S. and C. C. Lu. 2002. A New Species of Luteuthis (Mollusca: Cephalopoda: Cirroctopoda) from the South China Sea. Zoological Studies, 41: 119-126. Page: Tree of Life Cirrate Shell Terminology Authored by Richard E. Young, Michael Vecchione, and Katharina M. Mangold (1922-2003). The TEXT of this page is licensed under the Creative Commons Attribution-NonCommercial License - Version 3.0. Note that images and other media featured on this page are each governed by their own license, and they may or may not be available for reuse. Click on an image or a media link to access the media data window, which provides the relevant licensing information. For the general terms and conditions of ToL material reuse and redistribution, please see the Tree of Life Copyright Policies.